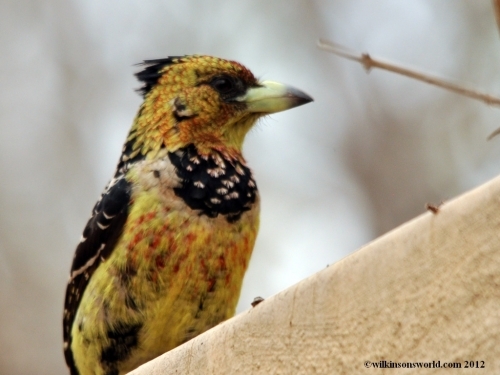 The Crested barbet is the largest of the barbets in the region, with a length of approximately 24 cm. 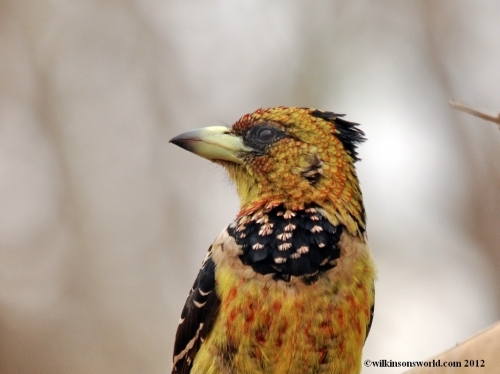 It has a yellow head, speckled with red and surmounted by a black crest. Underparts are yellow, save for a black chest band spotted with white. Wings and tail are black spotted with white; legs and feet are grey-black; bill is pale yellow with a black tip; eyes are brownish-red. 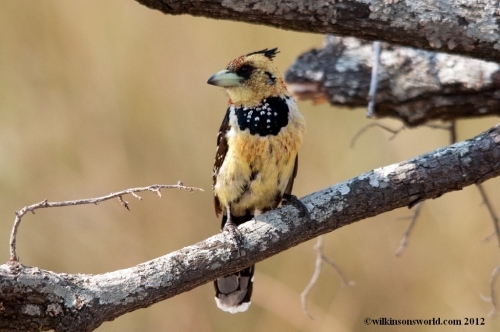 Males and females are similar in size, but are less brightly coloured. The Crested barbet’s loud and sustained trilling “tr-r-r-r-r-r-r-r” is often heard before the bird itself is sighted. Both the males and females sing, and on occasion this rather unmusical song takes the form of a duet. Crested barbets forage mainly on the ground, feeding on termites, grasshoppers and other insects as well as snails, but it is omnivorous and also feeds on fruit and nectar. These barbets are monogamous and generally make a nest hole in a dead tree stump or other convenient place, but may also take over the nests of other hole-nesters such as Red-throated wrynecks (Jynx ruficollis). In suburbia they may nest in nest boxes. The female lays a clutch of two to five eggs that hatch after an incubation period of approximately 17 days. Their nests may be parasitized by the Greater honeyguide (Indicator indicator) or the Lesser honeyguide (Indicator minor). The scientific binomial for the Crested barbet is Trachyphonus vaillantii; Trachyphonus from the Greek for a “rough voice”; and vaillantii after the ornithologist Francois Le Vaillant who travelled in South Africa in the late 1700’s. 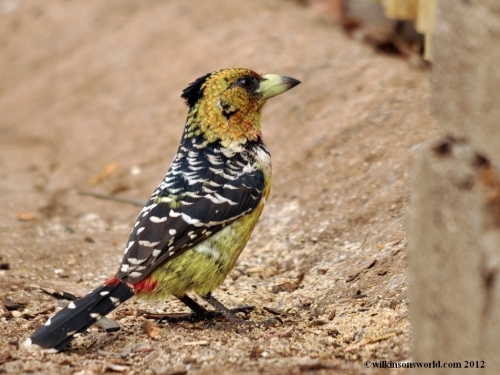 I don’t know about the “rough-voice” in the case of the Crested barbet, but it is nice to see the earlier pioneer ornithologists honoured in this way. 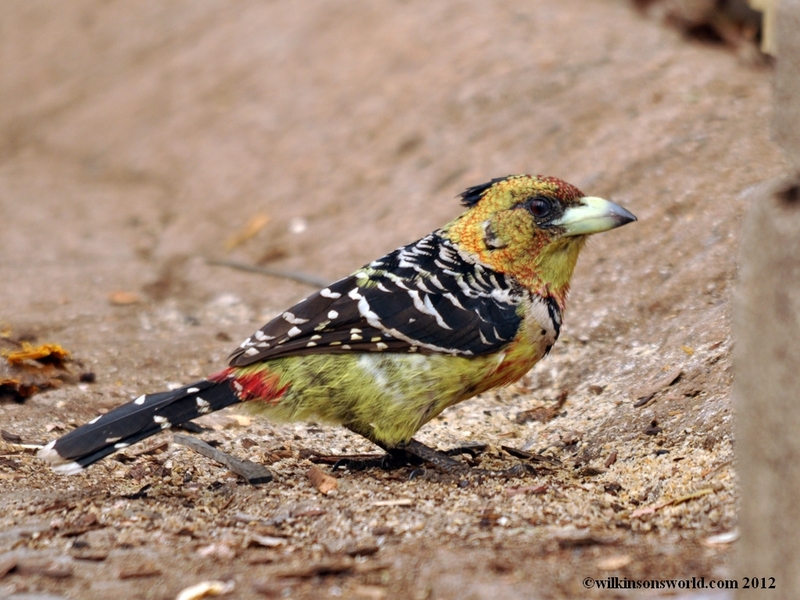 This entry was posted in Bird of the week, Birding and tagged Crested barbet, Kalizo Lodge, ornithologist Francois Le Vaillant, rough voice, Trachyphonus vaillantii on December 24, 2012 by Rob.